We spotted Robert picking food up at the Santa Monica vegan restaurant Real Food Daily while we were eating there last weekend. 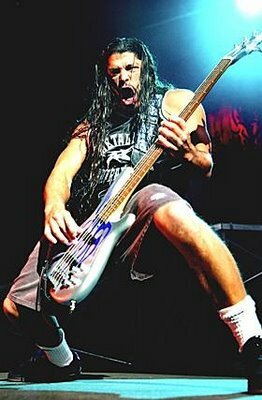 For those of you who may not know, Robert Trujillo is the current thud staff man in Metallica. I highly recommend the movie Some Kind of Monster which documented the recording of the album St. Anger and the coming of Robert into the band; it's a great rockumentary, even if you are not a fan of the band's music. Robert is an amazing player who favors using his fingers rather than a pick, but who is nevertheless one of the fastest guys around, in the vain of Geezer Butler, Steve Harris, or Geddy Lee. Gotta respect the bassman!